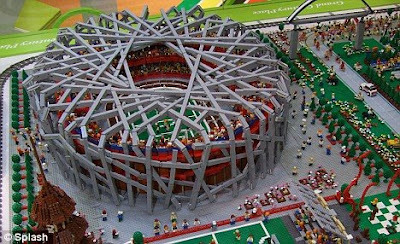 Check out the Olympics made of Lego's. Michael Phelps autographed cards are selling for crazy money on eBay. The below 2004 Donruss Leaf "Fans of the Game" card is going for more than $400.00 a pop. The Upper Deck 2005 Autographed card below (limited to 10) was available only at the Hawaii Trade Conference and is already at $3,850.00. Cardboard Junkie shows off my favorite Olympic card set- the 1983 Topps Greatest Olympians. I know this is a card with a hockey player on it, but I can't even begin to tell you how eager I am for the season to begin. 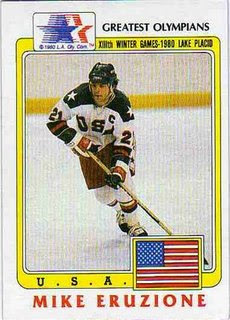 BTW, did you know that Eruzione means eruption. His winning goal in 1980 was like Mount Vesuvius blowing his top. 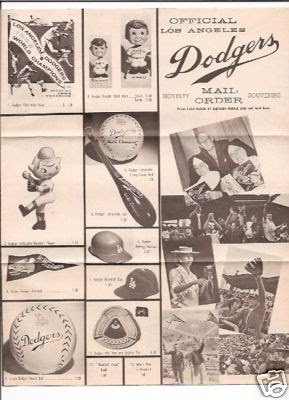 The Inside the Park Blog shows off an early 60's Dodgers souvenir mail order catalog. I've seen most of the items before. The bobbleheads at the top are very rare and highly sought after. The pennant, ashtray, helmet and hat are readily found on eBay, but that cartoon looking toy of the pitcher is totally new to me. This guy knows how to catch a ball. With no glove in hand he uses the best thing he's got- a cup of beer.